Queen Nefertiti's name translates as "a beautiful woman has arrived." To Egyptians, she remains a symbol of their country's impressive history and beauty. So, when the authorities wanted to commission a statue at the entrance of the city of Samalut in 2015, they thought of the ancient queen. 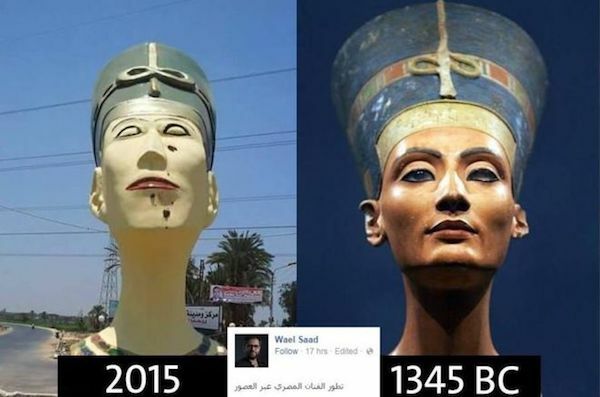 Normally, that would be a good thing, but the statue bore so little resemblance to Nefertiti that many began to despair for the state of Egyptian art. After a public and social media outcry, the ugly bust was removed and has been replaced by the statue of a peace dove. 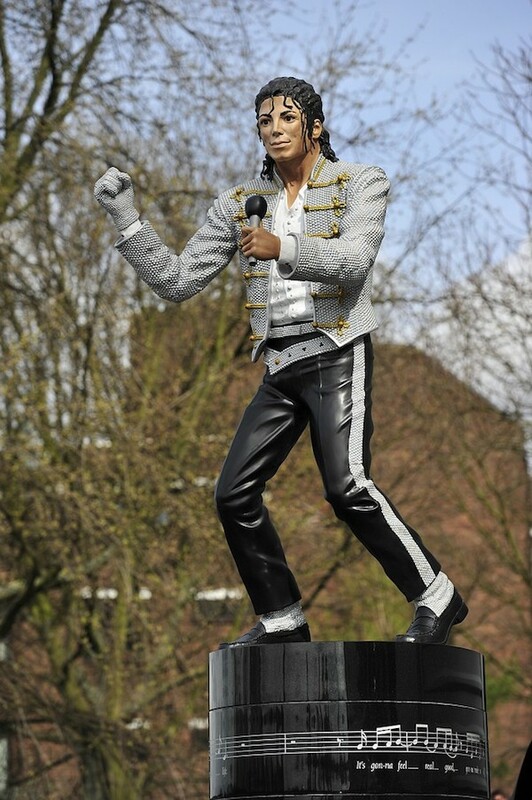 In 2011, this six-foot high golden statue of the King of Pop was unveiled at Fulham football club to a chorus of outrage. Even fans of the singer were put off by the unflattering monument. Fulham chairman and owner Mohamed Al Fayed, a close friend of Jackson's, who had no links to the club whatsoever, said of the effigy, "Michael Jackson was truly a legend, a term used too often in this modern world. I hope that Fulham fans will appreciate seeing the finest performer in the world in and among them." They didn't, and in 2013, when Al Fayed departed Craven Cottage, Fulham’s new owner, Shahid Khan, sent the statue packing with him. Ok, we know it's not a statue, but it's so unbelievably creepy we had to include it. 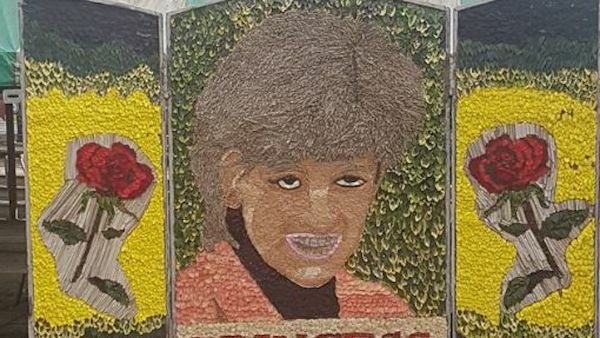 This tribute to Princess Diana has been ridiculed pretty much everywhere, with descriptors including "horrendous" and "a disgrace" used to describe the artwork. The memorial was placed in the town center of Chesterfield, Derbyshire to mark the 20th anniversary of the Princess of Wales' death. It was created by volunteers (their hearts were in the right place) but was widely circulated on social media for all the wrong reasons as many said it looked nothing like the late royal. 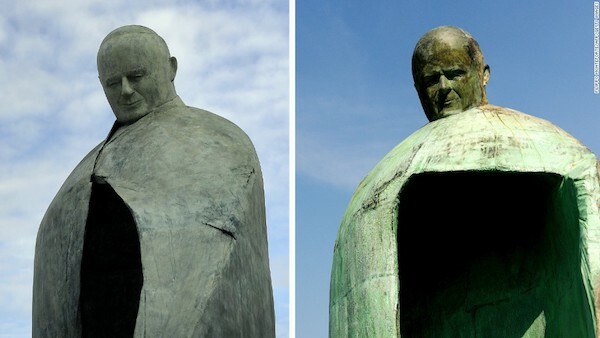 A 16ft-tall bronze statue of John Paul II was criticized for bearing little resemblance to the much-loved Polish pope when it was originally erected in May 2011 in Rome. Locals called it "hideous, " and Vatican's newspaper L'Osservatore Romano said the sculpture looked as though a bomb explosion had gashed it. As a result of the outcry, modifications were made to the pontiff's body, but his head still looked excessively large and bulbous. He's been since given a smile, and his neck is now slightly more defined. 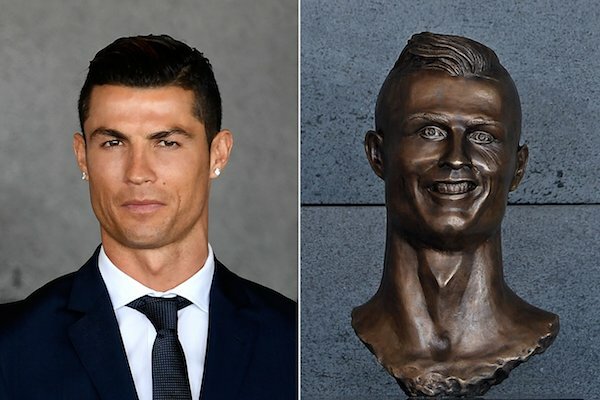 Oliviero Rainaldi, the sculptor who created the statue, said he was pleased with the alterations, saying they matched his original vision, but some still weren't happy. "They've made it worse," said Fabio Sabbatani Schiuma, a member of Rome's city council. "It looks even more like Mussolini. To celebrate the memory of a great pope like John Paul we could have done a lot better." “It is impossible to please the Greeks and Trojans. Neither did Jesus please everyone. This is a matter of taste, so it is not as simple as it seems. What matters is the impact that this work generated. There is always the possibility of making a difference, I was prepared for all this. I used as a base some photos of Cristiano Ronaldo that I found on the internet, nothing specific. I put the photos next to me and started working on the bust." Remember, Jesus was a carpenter and not a sculptor, so that explains a lot. Behold—our nation’s ugliest Confederate statue. 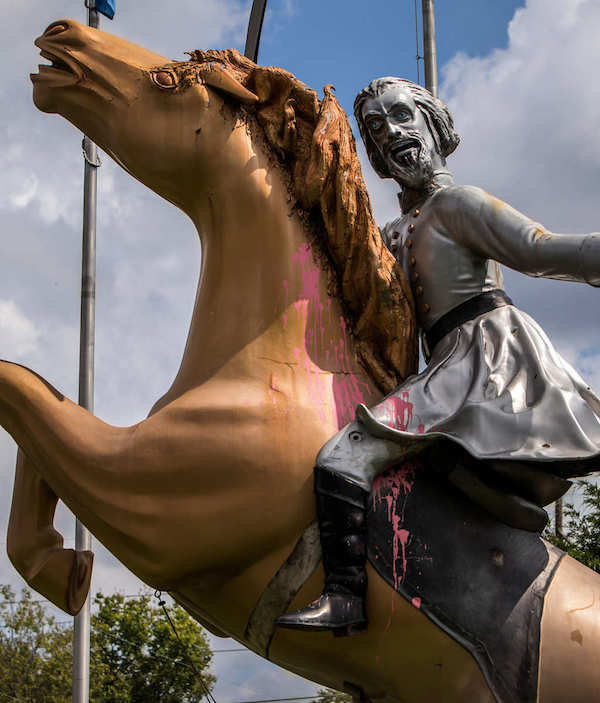 Confederate Lieutenant General Nathan Bedford Forrest sits astride his steed, 27 feet from horse hoof to saber tip, riding parallel to a roadway in Nashville. Crudely and cartoonishly rendered in polyurethane, the monument is so distorted and tacky that it looks like a joke, but it was carved and erected in total sincerity. Longtime resident Jack Kershaw created the sculpture between 1996 and 1998. A local eccentric, he was a painter, sculptor, lawyer, semi-pro quarterback, grassroots organizer, and an avowed racist. When he died in 2010, the Southern Poverty Law Center called him “one of the most iconic American white segregationists of the 20th century,” noting his role in founding multiple white-supremacist organizations along with his bizarre contribution to the country’s collection of Confederate monuments. Kershaw placed his statue on a private land next to the highway. Therefore, while other Confederate monuments are taken down in the aftermath of the white nationalist violence in Charlottesville, Forrest will ride on. When "Scary Lucy" went up in 2015, she went viral, and we get why—just LOOK AT HER! 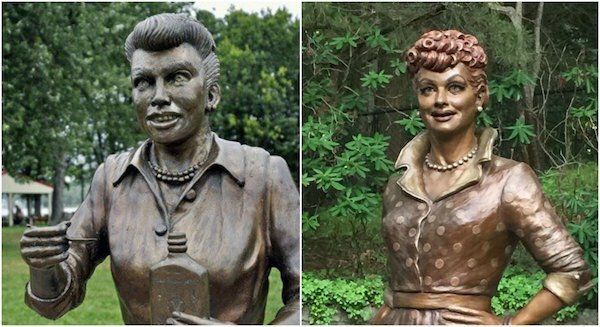 Celoron, NY, residents were shocked by the original statue and claimed it didn't quite look like her. (That's putting it lightly.) Mayor Scott Schrecengost and sculptor Carolyn Palmer stepped in and revealed a life-size replacement statue of the beloved I Love Lucy star during a ceremony on what would have been her 105th birthday in 2016. The crowd was overjoyed, and the statue was placed at the entrance of the Lucille Ball Memorial Park. As for Scary Lucy? She's still there, just deeper in the park. After all, she's still a viral superstar. "True friends stab you in the front. Always forgive your enemies; nothing annoys them so much." The list is endless, and they apply to pretty much every situation, even today. 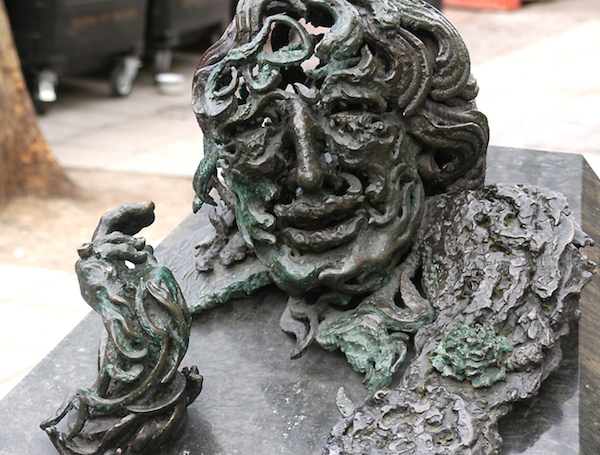 But we think, for all his wit and witticisms, Wilde would be rendered speechless by this hideous sculpture, created by Maggi Hambling and located on Adelaide Street near Charing Cross Road in London. Crying Jesus or Billy Ray Cyrus? 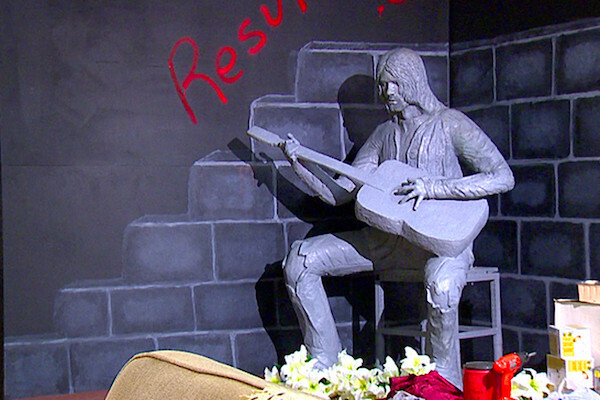 Neither—it's a statue of Kurt Cobain. His hometown of Aberdeen, Washington, honored him with it back in 2014. Randi Hubbard started the cement homage just after the Nirvana singer committed suicide and finished it a few years later with the help of local art students. She offered it to the town, but they initially refused it. So it sat in her muffler shop for years. By 2014, the town was ready to accept it. "We should have done it a long time ago," Aberdeen Mayor Bill Simpson said. The statue is now permanently housed in the Aberdeen Museum of History. Who knew Kate Moss was this disturbingly limber? One person who didn't mind the statue was Moss. The 18-carat gold statue, called “Siren,” sold for $900,000 in 2011.